It is undeniable to say that the CDI specification definitely changed the way of developing software using Java. The concept of dependency injection, which from the beginning is disseminated as a principle (and good practice) in object orientation, has become a first class citizen. In addition to the injection facilities, the ability to provide Beans that have a well-defined life cycle, made the CDI became one of the subjects most talked about lately in blogs, articles and presentations in various technology events. In the CDI version 1.0 (JSR 299), the Expert Group was very happy to specify as part of the functionality an important principle of object-oriented programming: The principle OCP (Open Closed Principle). This determines which objects should be open for extension and closed for modification. In CDI this feature was named Portable Extensions. This feature allows the CDI to be extended to the point of its modified behavior, enabling new features are available through the dynamic registration of new Beans CDI, modifying the metadata (qualifiers, alternatives and interceptors) existing beans and the creation of new contexts. Not take long for several Java communities and organizations realize that CDI could also be used as a foundation for frameworks or for integration with their existing products and technologies. With this, several initiatives in parallel spread quickly. Projects like JBoss Seam 3, Apache MyFaces CODI and CDISource become large (in terms of quantity and quality) repositories CDI extensions. At first, this only proved that the CDI specification became a success, by providing a true ecosystem for developers. However, in late 2011, the communities formed by Red Hat, Apache and CDISource decided to unite their efforts and create a set of CDI extensions in a standardized manner and combining the best features of each of these projects. Soon after, in early 2012, it was announced the DeltaSpike project. This project was incubated within the Apache Foundation until May 2013, when he became a top-level project. Even before the release of the final version, the DeltaSpike was already being used by other projects, such as PicketLink, Red Hat. The version 1.0 of DeltaSpike was launched in June this year and almost two months after it was announced at JavaOne 2014 (in September) that the project took home a statuette of Duke's Choice Award. Since then, this solution is gaining more users, contributors and contributions. In Figure 1 you can have an overview of the history of the project. Figure 1. Historical overview of DeltaSpike project. Container & Control/Test-Control: Both modules allow the startup and shutdown of ICD containers in Java SE environments, and to control the life cycle of contexts and facilitate the writing tests for CDI components. The viewing scope (@ViewScoped), where the beans are discarded when the user navigates to another page. This solution was already available in DeltaSpike before they become present in JSF 2.2 specification. The Figure 2 shows all the modules that make up the DeltaSpike. The modules represented in blue color only contain unique features, which were not even specified in the CDI. Already the module in green contains features that are already present in CDI 1.1, but thanks to DeltaSpike can run on Java EE 6/CDI 1.0 environments. The orange color indicates the modules that have already present features in CDI 1.1 and also other novel features. By having features already implemented in Java EE 7, some people may be led to wonder why use DeltaSpike. At this point it is worth remembering that in corporate environments the use of supported and approved Java EE 7 servers may take a few years and, in these cases, using the DeltaSpike, some of the features of Java EE 7 as well as numerous other features, will be available in your Java EE 6 server, allowing your code is up to date and facilitate a future upgrade, and, of course, the other possibilities and facilities that DeltaSpike available. Figure 2. DeltaSpike modules and its relations with the CDI 1.1. The installation of DeltaSpike can be done manually by downloading (see the address in the Links section) of the package and copy the JAR files to the application CLASSPATH. The DeltaSpike modules are always available in two files: a JAR containing the APIs and other JAR containing implementations. If your project is a WAR, copy both the module files you want to use for the WEB-INF/lib folder. However, the recommended way to install is to use Maven, where DeltaSpike dependencies can be declared in the pom.xml. A good practice is to declare the version of DeltaSpike as a property, thereby facilitating project update (see Listing 1). Then, as shown in Listing 2, you must compulsorily declare the core module and optionally the other modules you want to use. In all cases, the corresponding device API must be within the scope of "compile" and the corresponding device for implementation, the scope of "runtime", since the implementation is not required for compilation but is necessary for execution. Listing 1. Statement version of DeltaSpike. Listing 2. Declaration of the core module. As the name says, this is the central module of DeltaSpike. It is the only required module. Its aim is to serve as a basis not only for the other modules, but also to provide features in common for the application being developed. In this module you can find mechanisms for configuration and design verification stage, internationalization, resource injection, exception handling, beans exclusion, as well as a number of utility classes. The following are these mechanisms and sample code demonstrating its actual application in projects. During the software development cycle, applications need to behave differently depending on the current stage of the project, for example, do not carry out certain checks that should be present in the testing phases and production or to provide a Bean CDI which produces sample data only during the testing phase. Production - Represents the production phase itself. To know at what stage the project is just inject ProjectStage any Bean as in Listing 3. You can also use this information in JSF pages to display or hide parts of a page. See an example in Listing 4. The design stage of the setting is made by org.apache.deltaspike.ProjectStage property, by an existing configuration mechanisms. The DeltaSpike configuration API is presented below. Listing 3. Example of use of ProjectStage. Listing 4. Example of use of ProjectStage in JSF pages. The purpose of this feature is to provide a mechanism for applications (and also for the very DeltaSpike) which enables providing properties (key and value) fully flexible. To understand how to use this API in your favor, it is interesting to learn first as the DeltaSpike can be configured. Properties File: Represents the values available within a properties file. By default, DeltaSpike uses the META-INF/apache-deltaspike.properties file. In addition to these standard options, you can also write your own configuration source. This is useful if you, for example, allow your application or use DeltaSpike coming values of a database and /or files in XML, JSON, YAML, etc. As an example, say your application needs information from the JMS queue (name and user). So instead of putting this information "hardcoded" in the code, we can use one of the sources mentioned configuration to provide these values outside source. In Listing 5, these values were placed in /META-INF/apache.deltaspike.properties file. Note that the property jms.queue.name has a suffix Development (in line 1) and Production (line 2). This is an optional form of integration with type-safe ProjectStage, thereby allowing different configuration values for each stage of the project. If the value is the same, regardless of the stage where the project is, you can only inform the property without using any suffix, as shown by the line 3. Listing 5. File containing DeltaSpike settings. In Listing 6 we see how the properties can be accessed via injection, with the qualifier @ConfigProperty or programmatically using the ConfigResolver class (line 12). Listing 6. Example of how to get settings. In version 1.0 of the CDI, by default, all classes of a CDI project are available for injection. For this reason, there have been several complaints from users who wanted a way to prevent certain classes were available. The feature "vetoes" a class to become a Bean is present in CDI 1.1 specification, which from the @Vetoed annotation the annotated classes are now ignored. However, even there the @Vetoed annotation to CDI 1.1, the @Exclude annotation, provided by DeltaSpike, has some advantages, such as the possibility of longer ignore beans CDI CDI 1.0 and still ignore them based on the stage of the project (ProjectStage) or based on expressions. This feature opens the door to possibilities like having beans that are activated only under specific circumstances. In Listing 7 we can see some examples of CDI beans using @Exclude annotation. In line 1, the WillNeverInjected class is not enabled as Bean CDI for injection. In line 6, the MyBean class will always be available as a CDI bean, except when the stage of the project is "Development". In the line 11, in the opposite way, the MyBeanDevelopment class is enabled only when the stage of the project is "Development". Finally, on line 16, the MyBeanConfigurable class can only be injected into other beans if the expression informed within the onExpression parameter returns true. Listing 7. Examples of use of @Exclude annotation. Often based on the type of exception that happens in the system, we have the need to take some actions such as log message, notify the error to an administrative console, count the number of access attempts and block a user. In order to allow exceptions are handled in uncoupled form the class that threw the exception, DeltaSpike provides a mechanism from which the exception thrown as a CDI event can be treated in other classes. On line 13 of Listing 8 we see that the exception PersistenceException was encapsulated within the CDI ExceptionToCatchEvent event. From this moment, annotated classes with @ExceptionHandler will be used to handle these exceptions. Listing 8. Placing the exception in CDI event bar. Once the exception is CDI event bus, the developer must implement methods that treat. These methods should contain the first parameter with the @Handles annotation and type of the parameter must be ExceptionEvent. This ExceptionEvent class, in addition to providing information about the exception, also provides methods that control the exception processing, such as aborting the treatment in all handlers or mark the exception as already treated. In addition, you can still use Qualifiers CDI to differentiate equal exceptions, but they had different origins (batch processing, JSF form, REST endpoint). Listing 9 shows examples of exception handlers. builder.status(500).entity("Http Response Code 500: "
Working with internationalization, often we deal only with strings. To solve this problem the DeltaSpike brings the concept of internationalization type-safe through proxies CDI. In this way, the Java interfaces are used to represent system messages by simply receiving both the @MessageBundle annotation. In a properties file, the key property must have the name of the method of the annotated interface @MessageBundle. If there is a need to set a different key name, just use the @MessageTemplate annotation about the method name. Because it is a proxy CDI, this interface can also receive the @Named annotation, so that messages are also available in JSF forms. The Listing 10 interface and file properties in Listing 11 to provide an example of how we can use these interfaces to represent messages that are automatically translated according to the definition of the system or web-browser locale. Another interesting feature is that the translated messages can receive parameters passed in the methods. For example, invoking the method defined in line 15 of Listing 10 as Welcome ("Fabrício"), the displayed value will be the String "Welcome, Fabrício." To understand this behavior, note the line 3 of Listing 11. Listing 10. Examples of use of I18N DeltaSpike functionality. Listing 11. Examples of file properties. This Messages interface (defined in Listing 10) can be injected into other beans to provide messages (Listing 12) or be used in JSF forms as the example in Listing 13. Listing 12. Use of type-safe I18N in Beans CDI. Listing 13. Use of type-safe I18N JSF forms. During development, we often need to read a file that is on the hard drive or in a JAR. Thinking about it, the DeltaSpike brings simple functionality, but extremely useful for reading files. By using the @InjectableResource annotation on an InputStream as line 5 of Listing 14, the target file will be searched in the file system or in the classpath. Despite this feature, you can also implement your own mechanism to search for files, such as HTTP. Listing 14. Injecting InputStream for reading files. In order to provide a number of features to JSF, this module is installed as the core module, through the declaration of Maven dependencies in the pom.xml file. This is one of the largest modules DeltaSpike in functionality and see the key below them. @ViewScoped - Unlike what happens with @ViewAccessScoped, with this the scope beans are destroyed so that navigation is made to any other page. This scope is not part of CDI, but the JSF 2. However, like other scopes JSF 2.0 (javax.faces.bean.ApplicationScoped, javax.faces.bean.SessionScoped and javax.faces.bean.RequestScoped ), is promoted automatically by DeltaSpike to receive the same treatment given to the scope of the CDI (javax.enterprise.context. ApplicationScoped, javax.enterprise.context.SessionScoped and javax.enterprise.context.RequestScoped). The Java EE 6 brought the @RequestScoped annotations, duplicate @SessionScoped and @ApplicationScoped in javax.faces.bean packages and javax.enterprise.context by a divergence between the Expert Groups of the specifications CDI 1.0 and JSF 2.0. However, the JSF 2.2 specification says the javax.faces.bean package annotations will be "deprecated" in future versions and so developers are strongly recommended to avoid these annotations and use the options provided by the CDI. In JSF, the views are represented through the pages, whether or JSPs XHTMLs. These pages have metadata such as name, extension type (JSP or XHTML), navigation (forward or redirect), HTTP parameters that can be reported in the request, if the page is public or restricted, etc. In DeltaSpike, these metadata are represented as Java interfaces, which allow multiple inheritance, which allows one or more pre-defined metadata are applied to more than one view SFJ. This feature will be better understood through the example of Listing 15, explained below. As this list shows, we can see that two interfaces have been declared: the MinhaAplicacao interface, which in addition to extending the ViewConfig DeltaSpike interface, is also annotated with @View, setting the navigation metadata through a redirect; and SecurityPage interface that receives @Secured annotation, allowing apply security to folders and pages. As the SecurityPage interface extends the MyAplication interface, it also automatically receives, via inheritance, the definition of navigation. Thus, all secure pages do not need to set this information again. Also in Listing 15, we find two classes: Index and PaginaSeguraImpl. Both are identified by DeltaSpike during the application deploy as implement, even indirectly, the ViewConfig interface. Thus, the DeltaSpike expect to find the /index.xhtml pages and /postMessage.xhtml, otherwise an exception is thrown. Look again in Listing 15, the class name matches the page name, unless the @View annotation (line 16) is used to change the name, or even the extension. Also note that the Index class implements the interface MyAplication (line 5). This navigation of the Index page will be through redirection. Already SecurityPagempl class implements the interface SecurityPage (line 17), so that in addition to the navigation also be via redirection, this page will make the security check because it was set to @Secured annotation (on line 8). Once the JSF views were configured using @View annotation, you can perform navigation in two ways, as presented in Listing 16. The myAction1() method, the implementation returns the class (line 8) defined on line 13 of Listing 15. In the myAction2() method, the ViewNavigationHandler class was used to define the navigation at the end of the implementation of this method (line 12). Listing 16. Example of using ViewConfig for navigation. The concept of events in JSF is something that exists since its first specification. Today, even in the JSF 2.2 specification, you must reference the class that will hear the event at the faces-config.xml file or tag . The DeltaSpike allows events like BeforeJsfRequest, AfterJsfRequest, BeforePhase, AfterPhase, PostConstructApplicationEvent, PreDestroyApplicationEvent and ExceptionQueuedEvent be observed by the CDI. In this way, code as shown in Listing 17 can be written without the need to implement the interface PhaseListener JSF and register it in the faces-config.xml. Listing 17. Events JSF being observed by the CDI. Generally we want HTML forms are not submitted in duplicate when you accidentally double-click the button. To prevent a double (or more) click (s) in a commandButton cause the form to be processed multiple times, DeltaSpike provides the . To use it, simply declare the http://deltaspike.apache.org/jsf namespace in the JSF page and then declare it within the , as shown in Listing 18 code. Listing 18. Preventing double form submission. One of the most anticipated features of JSF 2.2 is the injection of beans IDUs in Converters and Validators JSF. However, this feature did not enter the 2.2 version of the specification, so that the dependency injection in Converters and Validators is not yet available. With DeltaSpike, on the other hand, the injection of both Converters CDI beans as for Validators it is possible and automatic, that is, no code or additional configuration is not required. As the name implies, this module is responsible for providing functionality to DeltaSpike related to security. The installation is made by adding Maven dependencies in the pom.xml (as exposed to the previous modules) and SecurityInterceptor return within the beans.xml (see Listing 19). Listing 19. Declaration of SecurityInterceptor in beans.xml file. This functionality DeltaSpike lets you create annotations that will be used to intercept method invocations and then verify that the implementation is allowed. As an example, let's create the @ApenasAdmin annotation - along the lines 1-5 of Listing 20 - which, as the name implies, allow only users who are in the Admin group can execute the methods. To tell DeltaSpike this annotation adds security (via interceptor) methods, it must have the @SecurityBindingType annotation (line 4). Then you only need to declare a method (in any class) that contains the InvocationContext type as a parameter and returns a Boolean value (lines 10-15). If the returned value is false, the method execution is denied and an exception of AccessDeniedException type will be launched. This method that performs the logic should also receive the @Secures annotation (line 10) and the annotation you just created (line 11). Note that you can use other Beans CDI as a parameter of this method. An example of this can be seen in Authorizing class in Listing 20, where the Bean CDI LoggedUser (line 13) is passed to the method. Once created the annotation, set the method and access logic, just write down the methods of application with the newly created annotation, as startAdministrativeTask () method (lines 21 to 25) of AdminBean class also declared in Listing 20. Listing 20. Using the Security-Binding. The @Secured annotation is a simplification of @SecurityBindingType note that we have seen, it allows you to write directly the methods in which to apply security and specify both the class that contains the logic. This annotation is usually used to make security JSF views as shown in the topic on type-safe view-config JSF module, and also to enable integration with other security frameworks such as JBoss PicketLink. Listing 21 shows the modified AdminBean class to use @Secured annotation. Note that @Secured specifies the AdminDecisionVoter.class value. This class implements the AbstractAccessDecisionVoter abstract class, provided by DeltaSpike, so simply implement the checkPermission() method to check whether or not security breaches according to your need. Data module focuses on the persistence layer, bringing the user a more productive experience with the JPA. This is possible through the implementation of the Repository pattern, which as well as the DAO pattern, centralizes access logic, as well as queries related to specific entities. In addition, this module provides the ability to perform the audit of JPA entities. Because the Data module works directly with the JPA, it is mandatory that the EntityManager is available as a Bean CDI. For this, we need to expose it to the application via a CDI @Produces. Listing 22 shows an example of code that complements your installation. Listing 22. Exposing the EntityManager via @Produces. The default repository project is defined as a mediator between the application and data repository (DAO, EntityManager, etc.). Its main role is to act as a research translator, but there are no restrictions to the repository also perform operations such as insertion and removal of data. The Links section contains the address of an excellent article on this standard. By adopting the DeltaSpike the default repository can be implemented easily, because we only need to create an interface that extends the generic interface EntityRepository inform the type of entity and the type of the primary key (line 2) as a generic type, and annotate this interface @Repository (see Listing 23). Then, at runtime, the DeltaSpike inject a proxy created by him to perform the operations. In addition to the query operations, the EntityRepository interface defines a number of common operations like save, delete, search by primary key, etc. These operations are always available so that the code used for creating repositories impressed by the low number of lines. Listing 24 shows the most important methods of EntityRepository interface. Listing 24. Methods of EntityRepository interface. In line 4 of Listing 23 we see that the @query annotation was used to inform what the JPQL that will run the EntityManager when findByName() method is invoked. In the line 8 this annotation was not used because, by default, DeltaSpike uses the method signature to mount the JPQL clause. These methods that automatically create the JPQL based on their names must return an entity or a list of entities and have their name starting with findBy followed by the name of the entity's property that is managed by the repository. It is also possible to use operators such as "AND" and "OR", and comparators as "Equal", "Like", "IsNull" the method name. In the case of findByNameAndPassword() method (line 8 of Listing 23), the JPQL created will be: "SELECT u FROM User u WHERE u.name = ': name' AND u.password = ':password'". To enable auditing, simply inform the listener DeltaSpike (org.apache.deltaspike.data.impl.audit.AuditEntityListener) in @EntityListeners annotation (line 2 of Listing 25). Once this is done, your organization must have properties to store the date/time of creation, modification and who changed it, with their @CreatedOn annotations, @ModifiedOn and @ModifiedBy. For the DeltaSpike identifies the user who made the modification, it is necessary for the application there is a method annotated with the qualifier @CurrentUser and @Produces and return the user ID in the form of string, as the line 26 of Listing 25. Listing 25. Auditing an entity. The installation of the JPA module is made by adding the Maven dependencies in the pom.xml file and TransactionalInterceptor statement in beans.xml file (according to Listing 26). As the Data module, this module also works directly with the JPA. Therefore, it is mandatory that the EntityManager is exposed to the application through a CDI producer, as already shown in Listing 22. Listing 26. Declaring TransactionalInterceptor in beans.xml file. To allow CDI beans have a transactional context as EJBs, this module provides the @Transactional annotation, allowing the use of transactional contexts CDI beans that are not EJBs. 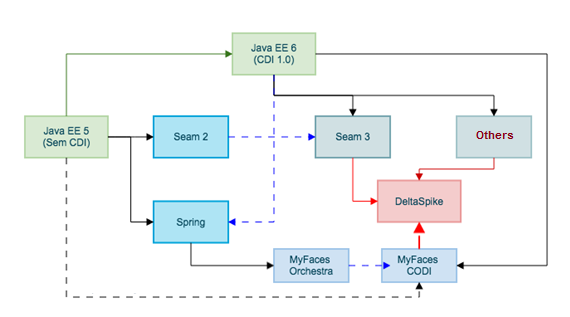 @org.apache.deltaspike.jpa.api.transaction.Transactional, enables the same behavior in Java EE 6 environments, as well as Java EE environment 7, but with the advantage of being integrated with a new scope defined by this module the @TransactionScoped. The @TransactionScoped scope of the context is automatically started at the same time the transaction is initiated by @Transactional annotation DeltaSpike and finalized at the time the transaction is completed (through commit, rollback or timeout). One of the projects most used for Java job scheduling is the Quartz. However, quartz is not integrated with CDI, so that jobs can not receive the injection beans dependencies through @Inject annotation. Thinking about it, the DeltaSpike provides integration between CDI and Quartz that enables any Bean become a job, behaving these jobs receive dependency injection via @Inject annotation. In addition, these jobs are easily booked through @Scheduled annotation. The @Scheduled annotation (see line 1 of Listing 27) lets you set the schedule using a CRON expression (see BOX 1) and further define the Job is automatically scheduled in application deployment through OnStartup parameter. CRON expressions are common in Linux environments and is used to define administrative routines with the application 'cron'. This application has this name because it is derived from the word chronos. The CRON expressions are formed by six or seven fields that indicate respectively: seconds (0-59), minutes (0-59), hours (0-23), day of the month (1-31), month (1-12), day (1-7) and year (optional). '?' - It means that there is a specific value. Thus, the expression "0 0/1 * * * ?" Means that the Job will run to zero seconds of one minute, at all hours, days, months, and no matter what day of the week. Listing 27. Example of CDI bean that is also a Job Quartz. If the OnStartup parameter is false, you must register the Job manually (see line 8 of Listing 28), just to inject this class Scheduler . This class also provides pause, resume, stop and consult Jobs. Listing 28. Manually Registering the Job. 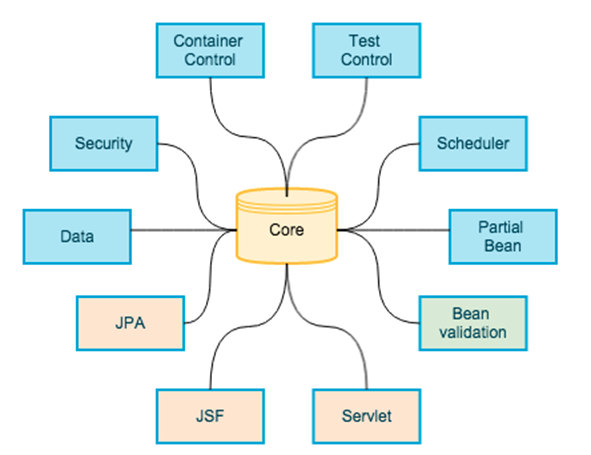 To the Bean Validation specification 1.0 Java EE 6 was not possible to beans injection CDI or EJBs within the classes that perform the validation. How's functionality is already possible in the Bean Validation 1.1 of Java EE 7, the purpose of this module is to enable this feature in Java EE 6 environments, since the possibility of dependency injection in classes that perform the validation is very useful, allowing for example, reuse business rules already in service classes or EJBs. To install this module, the only requirement needed, and configure the dependencies in pom.xml file, you have within the META-INF/validation.xml the definition of ConstraintValidatorFactory the DeltaSpike, as shown in Listing 29. Listing 29. 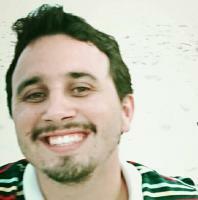 META-INF/validation.xml file - enabling the bean-validation module in Java EE 6. Some DeltaSpike modules bring smaller features and no less important. For example, with the Servlet module, you can have access to HttpSession objects, HttpServletRequest and HttpServletResponse within CDI beans and also listen to events of the life cycle through the CDI @Observes. But the Partial-Bean module allows you to create proxy classes that replace interfaces (or abstract classes). In turn, the Container Control module enables independent implementation that is used (Weld, OpenWebBeans, etc. ), CDI containers and servlet containers like JBoss Undertow, Apache Tomcat and Jetty are initialized and finalized. Finally, we can mention the Test Control module, which integrates with JUnit allowing injection CDI beans in test classes and also setting the stage of the project (ProjectStage) and controlling IDUs contexts assets. Thus, the tests in beans CDI integrated to DeltaSpike can be tested easily and with little configuration. Listing 30 shows a JUnit test example by @TestControl annotation, determines which settings will be initialized and what will be the stage used project. Listing 30. Test Example Test using the Control. As we have seen, the DeltaSpike is not a framework, but rather a set of CDI extensions that bring many features that are not available in the specification. Obviously these features should be used according to need and demand. And for this, one must have knowledge of what this project can offer. In addition, it is known that some companies should take some time to migrate your servers to Java EE 7. DeltaSpike enables some features of Java EE 7, among many others, to run in the Java EE 6 servers so that a future upgrade is performed gradually. We can not fail to mention that the DeltaSpike is, in itself, highly extensible, so that the features presented in this article can be customized to meet a specific need. Because it is an open source project, the reader is encouraged to contribute ideas and new extensions implementations, as well as patches and documentation. On the website of the project you can find all the detailed documentation of these features, instructions to subscribe to the mailing lists and how to get the sources and carry out the project build. Specification of JSR 299 (CDI 1.0). Winners of the Duke's Choice Award in 2014.